My favorite part of the movie Breakfast At Tiffany's is when Audrey Hepburn says she is always happy when she browses at Tiffany's . Tiffany's is a high end jewelry store on Fifth Avenue in Manhattan. I have not been there in years , but it looks really expensive and old money in there. It feels cool to be in the presence of such high end jewelry. I actually have one item from Tiffany's . Its a gift from a dear friend of mine. Its the Tiffany's heart key chain. I have lost the little ball on the end that holds the key chain together several times. Fortunately I have a friend who also owns one of these key chains who told me that Tiffany's will replace the little detachable ball so long as the heart is still on the key chain. The first time I replaced the little ball I felt silly. That was before I got the replacement. It comes in a classic blue Tiffany's light blue felt pouch and a mini light blue box. It almost made me feel happy I had been such a klutz and lost the little ball in the first place. I don't know if they still package the replacement ball so fancy . Its been a few years since I last lost it, but I am fairly certain they still replace it at no charge. This is why I understand why Audrey Hepburn loved browsing at Tiffany's. Who could be sad in such a classy store? The latest crazy law that has been in the news lately is about letting men who are transgender women into the women's room and even worse, letting boys who think that they are girls into the girls bathroom in public schools. Many states are suing Obama about this issue and they are right. I do not think that there should be any laws about letting transgender women into the women's restroom. The ones one can't tell were originally men are already using the women's room anyway. There does not need to be a law about it. I think that making it a law that any man who thinks he's a woman can use the women's bathroom is a recipe for disaster. I guess this is Obama's answer to extreme feminism. The feelings of men who think that they are women are more important than the safety of those of us who are actually women. I haven't heard of any laws about letting women who think that they are men go into the men's room. Why doesn't anyone want to sneak into the men's room? And you know what, it does not bother me if a woman who is a transgender man uses the ladies room because they are really women. Obama should have left well enough alone. I don't think a man is a woman just because he wants to be and I don't want to see him in the ladies room. If Obama wants to insist upon all restrooms being one person at a time sized rooms then OK. I think that there could be a men's room , a women's room and then a one person alone at a time restroom for those who think that they are a gender other than the one they were born to. I know that there are some who are transgender, but I do not believe that there are so many people who exist like this. I wonder what smoke and mirrors this stupid controversy is distracting the American public from . What is going on in the world that it being messed up by our president that he wants to distract us with this transgender debacle? Why does he need this to be his swan song ? Or what is he messing up that he does not want us to notice with his fixation on transgender equality for the minuscule part of the population that suffers from it ? In honor of Pesach shayni I am posting this. Its fabulous. Every year Midwood , Brooklyn is treated to the Brooklyn Half Marathon. Its a 12 mile marathon that starts at the Brooklyn Museum and ends in Coney Island. It runs down Ocean Parkway which is blocked off for the runners. It is always on Shabbos. It was today and I passed by it . It was fun to watch all of the surprised frum Jews crossing through the runners on Ocean Parkway on their way to shul. This video did not capture that , but I saw it. It was especially fun to see the reaction of little kids who once they had made their mad dash through the runners wanted to do it again. I have not tried this yet but I plan to. I think that it will work. The video is a bit slow moving, but at the end there is a list of what to do. She recommends using warm hemp oil treatments. I have tried olive oil and coconut oil treatments which help a lot . I have tried hemp oil, but I never tried heating up the hemp oil like this video recommends. Spraying the scalp with apple cider vinegar between oil treatments is also recommended. This young woman says this regiment has controlled her scalp psoriasis for the past three years. I think this is worth a try. I will try it and let you know if it works. I am so sick of using conventional medicine for scalp psoriasis. The cost is awful and it does not always work either. If this could work even MOST of the time it would be worth the effort. Wish me luck. I wasn't really a Star Trek fan, but I am familiar with the Vulcan salute. Its cool to hear Nimoy tell the story of how the salute was chosen. This is a more comprehensive rendition of the STITCHING HISTORY exhibit. Hedy Strnad did not survive the shoah, but her sketches did . These sketches were sent to relatives in America in hopes that it would help her find a job in the United States and to escape the Nazis. 6o years later these letters and sketches were found again by their relatives in Milwaukee and then donated to the Jewish Historical Society in Milwaukee. In 2014 the museum worked with the Milwaukee repertory theater to reproduce these dresses and have a fashion show. These dresses are exquisite. Such creativity was lost. Imagine how much more creative and beautiful the world would be if these people had not been murdered. Though I have included many photos, nothing beats seeing these creations in person. You won't regret it. I have long known about the most sad murder of Leo Frank. I just never knew the details. I recently visited the Museum of Jewish Heritage in NYC where there is an enlightening exhibit about Leo Frank. 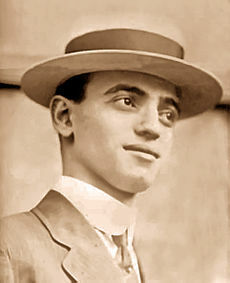 For those who are not familiar, Leo Frank (1884-1915) was born in Texas and raised in Brooklyn. He was Jewish. (duh). He was an engineer and ended up managing a pencil factory in Atlanta Georgia where a gentile girl named Mary Phagan was murdered by a black man named Jim Conley. Unfortunately the murder was pinned on Frank , due to anti-semitic judges and jury who went out for their way to convict Leo Frank of a crime he did not do. The governor of Georgia Frank Slaton was appealed to . He realized that there were a lot of inconsistencies in the case and that Leo Frank was innocent. He blocked the death sentence for Frank in favor of life imprisonment which would give time to eventually free him from prison. This did not happen. A lynch mob extracted him from jail and hung him. Frank is the only known Jewish man who was lynched in America. It is heart breaking. He was 29 when he was arrested and 31 when he was murdered. The exhibit had the original newspapers that chronicled the case. It was chilling to see Leo Frank's handwriting. Its hard to imagine such blatant anti-semitism . The exhibit also has a short film with testimonies from relatives of Leo Frank as well as relatives of Mary Phagan who continue to blame her death on Leo Frank. Also included on video is Alonzo Mann, Leo Frank's then 14 year old office boy in 1986 testified that he saw Conley shortly after Pagan's murder carrying her to the basement of the office building at the time the murder wast to have taken place. This deposition by the anti defamation league formally pardoned Frank posthumously of the murder of Phagan. I spent several hours reading through this exhibit. It is not so easy to do . It struck me just how young Leo Frank looked at 29. Such a waste. It was TO KILL A MOCKINGBIRD with a Jew. If you don't know much about this grievous injustice, be sure and see this exhibit at the Museum of Jewish Heritage . I admire those who are neat by nature. I would not consider myself a hoarder but I can often be the queen of clutter. The crazy part of holding on to some things too long is that it can be depressing looking at them instead of nostalgic. I find it can be hard to maintain that balance of what to hold on to and what not to. The good part is that when I finally tidy up and get rid of excess momentous I find I never miss what I have discarded. I read Marie Kondo's book about tidying up. It has some good suggestions but I think that everyone has to create his/her own tidying strategies. With possessions less really is more. It really is more tranquil . I am not suggesting to live like a pauper but if you have too much stuff you may never be able to find ANY of your treasures because you have too much stuff.